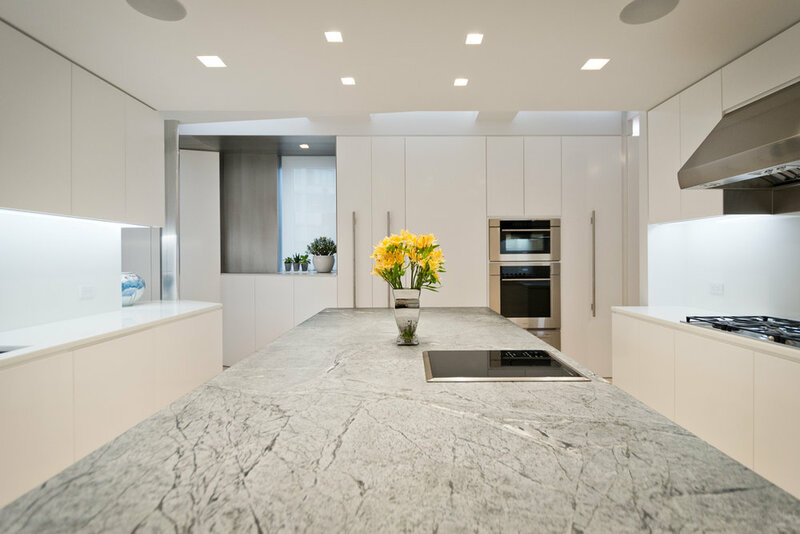 Located in New York City’s Upper West Side, this complete renovation project combines two previously separate apartments into a single residence. The residence offers respite for a four-person family to live, sleep, and entertain. The home is designed as a calm, tranquil escape from the energetic bustle of Manhattan without leaving the city. Spaces feel large and open, and the design of circulation offers multiple connections between adjacent spaces, preserving a loft-like atmosphere. 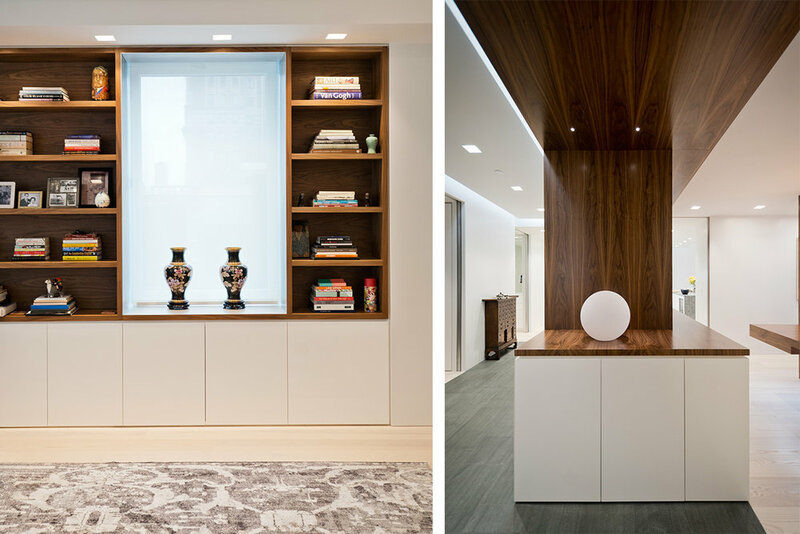 Custom-designed millwork and built-in furniture throughout the apartment enhance the neatly organized layout while simultaneously providing a discreet means of maximizing storage space in order to eliminate clutter. The architectural composition of the space and the luxurious finishes are inherently beautiful, but also serve as a rich, complementary backdrop for the clients’ artwork and furnishings; a concerted effort was also made to work directly with the clients to incorporate elements of their Korean heritage. The apartment is divided into three zones: communal living spaces, a generous master suite, and a children’s suite. 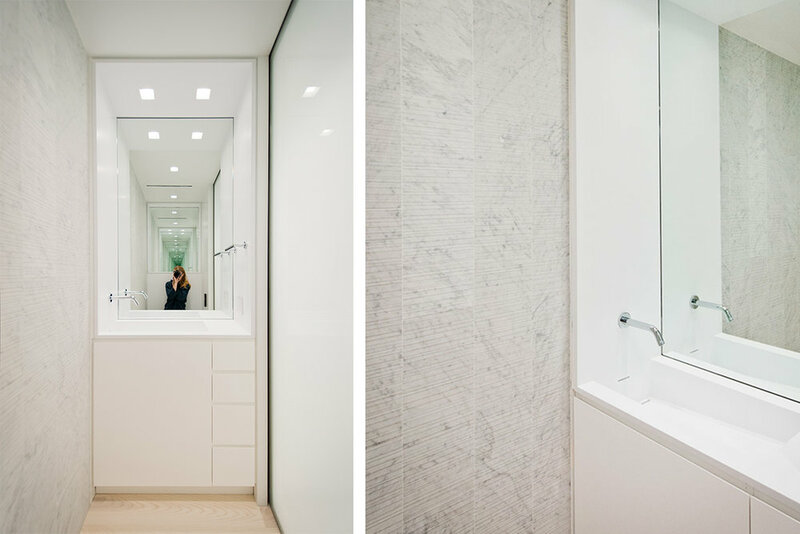 Privacy is afforded through the implementation of custom-designed oversize aluminum and glass pocket doors, which allow for each of the zones to be separated from one another while maintaining circulation within each, or the entire apartment can be continuously connected, if desired. The children's suite includes two bedrooms, two bathrooms, and a separate play space, making it easy for the adults to entertain while the children play or sleep. Most of the corridors throughout the apartment are lined with glossy white built-in millwork for storage, and bedrooms include built-in clothing wardrobes. Perimeter window benches in the living room also provide storage below. Other built-in components include a walnut sofa, walnut dining table, walnut bookshelves, walnut drink/food serving station, built-in desks, a folding wall bed, children’s bunk beds, the parents’ bed platform with integrated side tables and headboard, and recessed TV niches. In fact, the only elements that were not custom designed and built into the architecture are the sofas and chairs. During demolition, a number of existing immovable mechanical and plumbing elements were discovered, creating opportunities for the architecture to respond to and embrace these conditions. 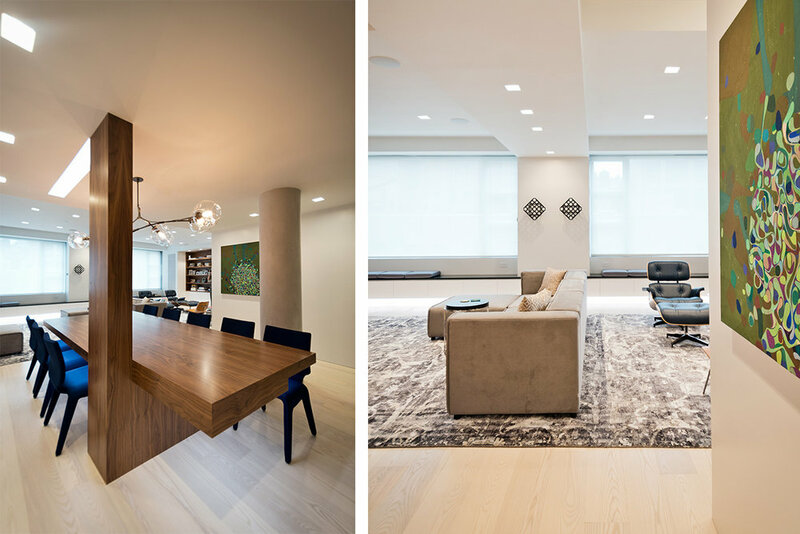 The custom walnut dining table is built around an existing gas pipe, integrating the table directly into the overall design while enhancing the communal aspect of this project. A unique black steel-clad hallway angles and bends around in a playful configuration to cleverly conceal an existing plumbing riser. Existing structural columns—refinished with smooth concrete texture—float within large spaces, becoming purposeful elements of a cohesive composition. Elevator doors opening onto the entry foyer are similarly integrated into surrounding wall finishes. The architecture also introduces instances of fun and whimsy: multiple secret doors are integrated into concealed conditions, such as a cabinet that pivots to reveal a connection between the parents’ master suite and the children’s bedroom zone. A black steel-clad door panel nests into the surrounding black steel-clad walls, disguising its function to separate the den, which can be converted into a guest bedroom by deploying the integrated fold-out wall bed (also known as a “murphy bed”). High-tech features are incorporated into a whole-house integrated control system, which automatically manages predefined settings. Depending on the season, time of day or activity of the occupants, the apartment can be easily transformed through the manipulation of lighting, music, motorized window shades, and temperature control; all of which can also be adjusted remotely through mobile apps on occasions where the family is traveling. The cumulative effect of plethora design decisions by the architects and clients creates a harmonious symphony of architectural design, epitomizing a modern luxury residence.